Alfred Williams (1877-1930), who was acclaimed in his day as Wiltshire’s ‘Hammerman Poet’ had largely been forgotten in Swindon, and I decided that recording an album about his inspiring life would go some way to setting the record straight. The Hammerman CD was recorded as a concept album in 2008 at Mooncalf, a studio fittingly situated on the rolling Wiltshire Downs at Draycot, just south of Swindon. 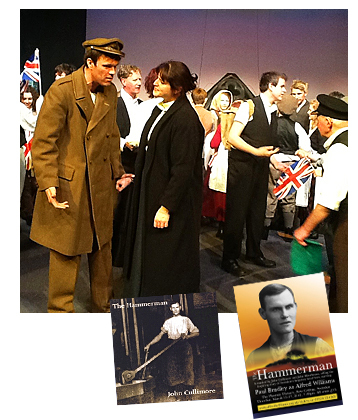 It turned out to be only the first step in a journey that took me to writing The Hammerman musical, in conjunction with my old school friend, playwright John Moorhouse. It was as a result of the album that I met fellow Alfred fans Caroline Ockwell and Graham Carter, and the idea of the Alfred Williams Heritage Society took shape – and hence the Alfred Williams Heritage Festival in 2010. The musical premiered at Swindon’s STEAM Museum during the festival in November 2010, and the musical was also performed at New College, Swindon, on three consecutive nights in March 2012. Work is currently ongoing in making the show available for other groups to perform, including local schools and colleges. Ever since discovering the remarkable story of such a local hero, I have been passionate about the life and work of Alfred, a subject which is not just interesting, but truly inspiring. The original music has folk-rock/rock opera and classic stage musical influences, while the lyrics are a blend of my own words and Alfred’s poetry.